RETRO KIMMER'S BLOG: JL HUDSON'S MAURICE SALAD RECIPE! This salad was made famous in the Detroit area during the height of the “downtown” Hudson building. This closely guarded recipe was served in their store restaurant. The historic building no longer exists, but the recipe does. 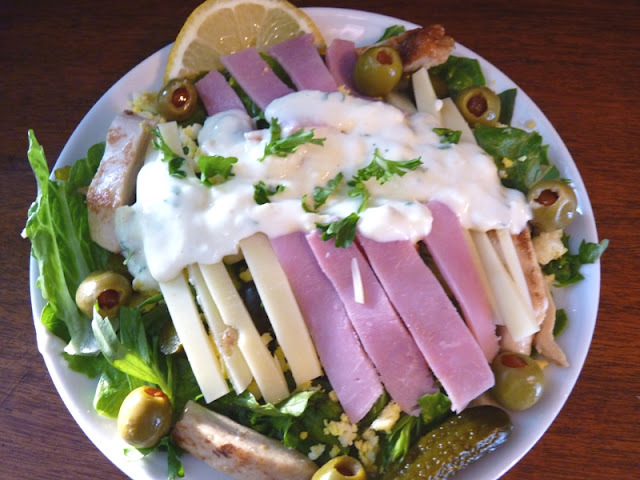 Taste a little bit of history with this unique salad! In a small bowl, whisk together the first 11 salad dressing ingredients until smooth (mayonnaise, grated onion, 1 mashed hardboiled egg, lemon juice, sugar, vinegar, mustard powder, black pepper, salt, milk or buttermilk). Because of the mashed egg, it will be a bit lumpy. (If you’re not lazy like me, feel free to blend using a blender to make it creamier.) Add a little more milk if necessary to thin it out a bit. Dressing should be the consistency of a thick ranch. Add the parsley and tarragon last, folding them into the dressing but mixing well. Cover, and let chill for at least one hour. (Overnight is best—it tastes fantastic the next day). 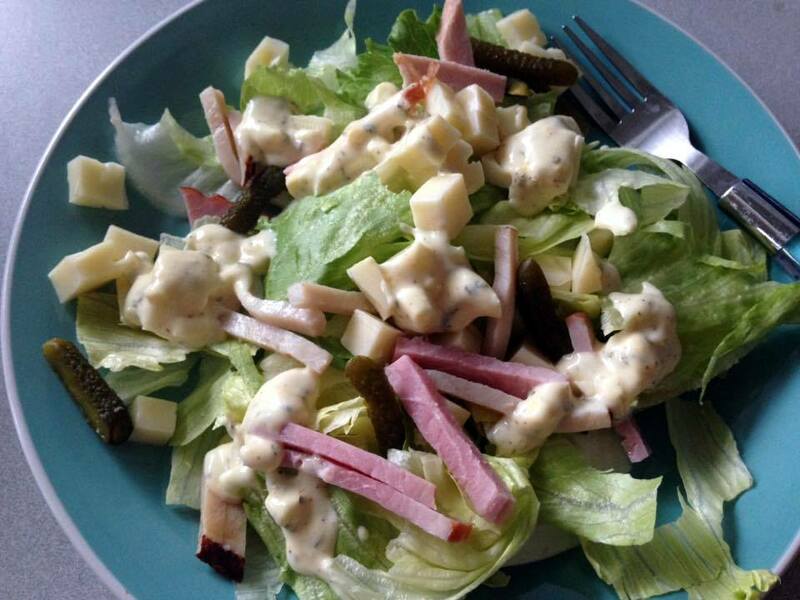 For the salad, chop the turkey/chicken, ham, cheese, cucumber, onion and pickles julienne style. (Save six pickles and leave them whole, for garnish on each plate.) Combine all ingredients onto the salad artfully. Each salad should have 6-8 olives. Garnish with an extra sprinkle of chopped tarragon, a few extra whole small gherkin pickles, the sliced hard-boiled egg, and a lemon wedge. Hi there, I managed Hudson restaurants in the 1990's made lots of these. The Grand Traverse Pire company has a close representation. They add hard boiled egg to the salad and don't have the olive garnish. The dressing is spot on. Ice berg lettuce used to be hard to get, so it was a staple.